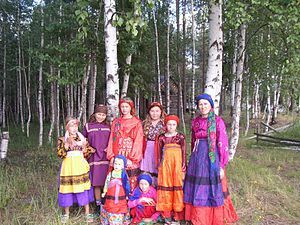 The Komi are a Uralic ethnic group whose homeland is in the north-east of European Russia around the basins of the Vychegda, Pechora and Kama rivers. They mostly live in the Komi Republic, Perm Krai, Murmansk Oblast, Khanty–Mansi Autonomous Okrug, and Yamalo-Nenets Autonomous Okrug in the Russian Federation. The Komi belong to the Permian branch of the Finno-Ugric peoples and are divided into eight sub-groups. Their northernmost sub-group is also known as the Komi-Izhemtsy (from the name of the river Izhma) or Iz'vataz. This group numbers 15,607 (2002). This group is distinct for its more traditional, strongly subsistence-based economy which includes reindeer husbandry. Komi-Permyaks (125,235 people) live in Perm Krai and Kirov Oblast of Russia. There have been at least three names for the Komis: Permyaks, Zyrians (Russian: пермяки, зыряне) and Komi, the last being the self-designation of the people. The name Permyaks firstly appeared in the 10th century in Russian sources and came from the ancient name of the land between the Mezen River and Pechora River – Perm or "Great Perm" (Russian: Пермь Великая). Several origins of the name have been proposed but the most accepted is from Veps Peräma "back, outer or far-away land" from Veps perä "back, extreme" and ma "land". In Old Norse and Old English it was known as Bjarmaland and Beormas respectively but those Germanic names might designate some other place than the Russian Perm. Since the 20th century the name has been applied only to the southern Komi (Komi-Permyaks) in Perm Krai. In Russian permyak also means "an inhabitant of Perm or Perm Krai" independently from ethnicity. The name for the northern Komis – Zyrians – has a more contradictory origin. It exists since the 14th century and it had many different forms in various Russian sources such as Seryan, Siryan, Syryan, Suryan and Ziryan, Zyryan (Russian: серьяне, сирьяне, сыряне, суряне, зиряне, зыряне), but the latter finally became predominant. Turkin believed that it may come from a small local tribe of the Komis (probably named saran) which first met the Russians, hence the name became default for all the northern Komis. The neighbour Finno-Uralic people call the Komis with similar names: Khanty sərän, sərån, săran, sārån, Mansi sarän, Nenets sānnğr, saran, Udmurt sara-kum. The name Komi is the endonym for all groups of the people. It was first recorded by ethnographers in the 18th century. It originates from the Finno-Ugric word meaning "man, human": Komi kom, Udmurt kum, Mansi kom, kum, Khanty xum, Selkup qum, Hungarian hím "male". The origin from the name of the Kama River is disproved though some scholars (like Paula Kokkonen) favour this version. The Komi language belongs to the Permian branch of the Uralic family. There is limited mutual intelligibility with Udmurt. There are two main dialects: Zyrian and Permyak. Until the 18th century, Komi was written in the Old Permic alphabet introduced by Saint Stephen of Perm in the 14th century. Cyrillic was used from the 19th century and briefly replaced by the Latin alphabet between 1929 and 1933. The Komi language is currently written in Cyrillic, adding two extra letters - Іі and Ӧӧ - to represent vowel sounds which do not exist in Russian. The first book to be printed in Komi (a vaccination manual) appeared in 1815. 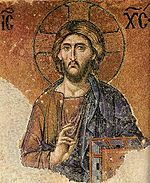 Most Komis belong to the Russian Orthodox Church, but their religion often contains traces of pre-Christian beliefs (see Komi mythology). A large number of Komis are Old Believers. Based on linguistic reconstruction, the prehistoric Permians are assumed to have split into two peoples during the first millennium BC: the Komis and the Udmurts. By the 16th-17th centuries, the Komis further divided into the Komi-Permyaks (who remained in the Kama River basin) and the Komi-Zyrians (who migrated north). From the 12th century the Russians began to expand into the Perm region and the Komis came into contact with Novgorod. Novgorodian traders travelled to the region in search of furs and animal hides. The Novgorodians referred to the southern Komi region as "the Great Perm". Komi dukes unified the Great Perm with its centre at the stronghold of Cherdyn. As the Middle Ages progressed, Novgorod gave way to Moscow as the leading Russian power in the region. In 1365, Dmitry Donskoy, Prince of Moscow, gave Stephen of Perm the task of converting the region to Christianity. Stephen's mission led to the creation of the eparchy of Perm in 1383 and, after his death, Stephen became the patron saint of the Komis. He also devised an alphabet for the Komi language. Nevertheless, some Komis resisted Christianisation, notably the shaman Pama. The Duke of Perm accepted baptism only in 1470 (he was given the Christian name Mikhail), possibly in an attempt to stave off Russian military pressure in the region. Mikhail's conversion failed to stop an attack by Moscow which seized Cherdyn in 1472. Mikhail was allowed to keep his title of duke but was now a vassal of Moscow. The duchy survived only until 1505 when Mikhail's son Matvei was replaced by a Russian governor and Komi independence came to an end. In the 1500s many Russian migrants began to move into the region, beginning a long process of colonisation and attempts at assimilating the Komis. Syktyvkar (Ust-Sysolsk before 1930) was founded as the chief Russian city in the region in the 18th century. The Russian government established penal settlements in the north for criminals and political prisoners. There were several Komi rebellions in protest against Russian rule and the influx of Slav settlers, especially after large numbers of freed serfs arrived in the region from the 1860s. A national movement to revive Komi culture also emerged. Russian rule in the area collapsed after World War I and the revolutions of 1917. In the subsequent Russian Civil War, the Bolsheviks fought the Allies for control of the region. The Allied interventionist forces encouraged the Komis to set up their own independent state with the help of political prisoners freed from the local penal colonies. After the Allies withdrew in 1919, the Bolsheviks took over. They promoted Komi culture but increased industrialisation damaged the Komis' traditional way of life. Stalin's purges of the 1930s devastated the Komi intelligentsia, who were accused of "bourgeois nationalism". The remote and inhospitable region was also regarded as an ideal location for the prison camps of the Gulag. The influx of political prisoners and the rapid industrialisation of the region as a result of World War II left the Komis a minority in their own lands. Stalin carried out further purges of the Komi intellectual class in the 1940s and 1950s, and Komi language and culture were suppressed. Since the end of the Soviet Union in 1991, the Komis have reasserted their claims to a separate identity. A study on north-eastern-european populations, published in March 2013, found that Komi-Zyrians form a distinct pole of genetic diversity. ^ a b Minahan 2002a, p. 1003. ^ a b Minahan 2002b, p. 1505. ^ "Russian Census 2010. Nationalities". demoscope.ru (in Russian). Демоскоп Weekly. Archived from the original on 2011-06-22. ^ "Russian Census 2002. Nationalities". demoscope.ru (in Russian). Демоскоп Weekly. Archived from the original on 2012-05-30. ^ "National composition of population". 2001.ukrcensus.gov.ua (in Ukrainian). State statistics committee of Ukraine, 2001 census. ^ "Soviet Census 1989. Nationalities". demoscope.ru (in Russian). Демоскоп Weekly. Archived from the original on 2010-03-16. ^ Туркин 1995, p. 25. ^ Туркин 1995, pp. 17-20. ^ Туркин 1995, p. 19. ^ a b c Туркин 1995, p. 20. ^ Туркин 1995, pp. 20-25. ^ Туркин 1995, pp. 24-25. ^ Туркин 1995, p. 23. ^ a b c d Туркин 1995, pp. 25-26. ^ Taagepera 1999, p. 301. ^ Taagepera 1999, p. 310. ^ Taagepera 1999, p. 313. ^ a b Minahan 2002a, p. 1004. ^ Taagepera 1999, p. 299. ^ Taagepera 1999, pp. 300-301. ^ Minahan 2002a, p. 1005. ^ Minahan 2002a, pp. 1005–1008. ^ Khrunin, Andrey V. (7 March 2013). "A Genome-Wide Analysis of Populations from European Russia Reveals a New Pole of Genetic Diversity in Northern Europe". PLOS One. Avril, Yves (2006). Parlons komi. Harmattan. Minahan, James (2002a). "Komi". Encyclopedia of the Stateless Nations. II (D–K). Greenwood. pp. 1003–1008. Minahan, James (2002b). "Permyaks". Encyclopedia of the Stateless Nations. III (L–R). Greenwood. pp. 1505–1509. Taagepera, Rein (1999). The Finno-Ugric Republics and the Russian State. C. Hurst & Co.
Туркин, А. И. (1995). "Происхождение названий коми народа" [Turkin, Adolf. The origin of the names for Komi people]. Linguistica Uralica (in Russian). XXXI (1): 17–28. ISSN 0868-4731. Tsypanov, Evgenii (March 2001). "Language and ethnic mobilization among the Komi in the post-Soviet period". Nationalities Papers. 29 (1): 109–128. doi:10.1080/00905990120036402. Wikisource has the text of the 1911 Encyclopædia Britannica article Syryenians.